The Belgian grid is part of an interconnected system stretching from Portugal to Poland. The grid comprises some 8,400 km of high-voltage connections (ranging from 380,000 to 30,000 volts), composed of overhead lines and underground connections. The Belgian grid is interconnected with France, the Netherlands and the Grand Duchy of Luxembourg (projects are also under way on direct interconnections with Great Britain and Germany). ElectricityIn terms of investment in generation capacity, a number of expansion and reinforcement projects are ongoing. By 2011, a total of 946 MW were under construction, 3,455 MW were authorised and 2,502 MW were planned. The development of off-shore wind parks requires further grid development. Further efforts are needed to enhance interconnection capacity and to integrate the physical electricity grid with neighbouring markets. However, in the summer of 2012, the testing of the flow-based market coupling mechanism was postponed.The Belgian transmission system operator, Elia, is responsible for grid planning in the Belgian electricity network. The planning process takes place in cooperation with the Direction générale de l’Energie and the Bureau fédéral du Plan, as well as with involvement from the Ministry of Naval Questions, which is responsible for offshore technologies. After approval by the Department of Energy, the network development plans take place over a period of ten years and are published by the TSO, subject to triennial adaptation. Grid development scenarios are first drafted by the TSO, with generation assumptions made based on the current electricity generation plan, with resulting scenarios serving as input to the market simulation and grid modelling, which is undertaken by the TSO.This resulting plan is sent on to CREG, the national regulator, which consults with relevant stakeholders and ministries, and regional regulatory authorities relating to renewable energies. Any further modifications are then sent back to Elia, which is required to amend the NDP draft accordingly. Although the development plans are considered legally binding, no consequences for non-delivery have been identified.GasThe country’s only storage facility, in Loenhout, was expanded in 2010. The increase in entry capacity at the Eynatten and Gravenvoeren interconnection points helps to alleviate the congestion that has occurred for years at these points. In addition, the east-west axis of the Fluxys network was reinforced and the Zelzate interconnection point at the Dutch border is now bi-directional. The debate has been divided between Belgium’s opportunity to continue to rely on nuclear power and how to adapt Belgium’s electricity system to a world characterized by more electricity from renewable sources. Discussions have shifted from electricity production to the electricity system, including transmission, interconnections, production, and demand. The Belgian energy sector is dominated by a high share of nuclear power, while RES-E had limited growth during the last 20 years. Belgium started from a very low share of 1.1% in 1990 and increased to 5.3% in 2008. In 2010, the RES-E share has slightly decreased and reached 4.63%. CREG's main mission is to (i) supervise and control the implementation of the regulation; (ii) set tariffs; and (iii) advise the federal government about the organisation and operation of the energy market. ElectricityMarket concentration was high with a dominant supplier — Electrabel Customers Service (ECS). In 2011, for customers connected to the distribution and local transmission grid, ECS had a market share of 45% (Electrabel, supplying bigger customers, has a 17% share of this market). Until 2012, electricity prices had not been regulated for domestic or industrial consumers. However, in March 2012, the Belgian government introduced a temporary freeze of the indexing of the energy components of electricity and gas prices for residential customers and SMEs for nine months, starting in April 2012. The government said the freeze was intended to implement structural measures to stabilise prices and foster competitiveness. However, the measure negatively impacts on the investment climate and disproportionately affects new entrants who are obliged to source large volumes on the wholesale market.Switching of suppliers is increasing steadily. In Flanders, 6.68% of customers switched in 2010, rising to 8.16% in 2011. The number of green contracts has risen notably; in Wallonia and the Brussels region, the switching rate was around 4%. For gas, the figures are similar. There are indications that switching increased rapidly in the first half of 2012 due to growing consumer awareness. GasMarket concentration remained very high. The dominant supplier is ECS. At federal level, the three biggest gas suppliers on the retail market covered 94% of consumption. Until 2012, gas prices had not been regulated in Belgium, but the government decision to freeze retail prices as described above also applies to the gas market. For gas, the figures for switching rates are similar as for electricity in Brussels and the Wallonia regions, Switching rates are even higher for Flanders: 7.06% in 2010 and 9.22% in 2011.The Transmission System Operators (TSOs) at federal level are ELIA for electricity and Fluxys for gas. In 2010, Electrabel/GdF/Suez withdrew from ELIA and Fluxys, moving towards ownership unbundling. In the 2013 National Reform Program, Belgium set a provisional target of 18% reduction in primary energy consumption compared to 2007 levels by 2020, equivalent to 53,300 ktoe, with a targeted final consumption level of 32,500 ktoe in 2020. 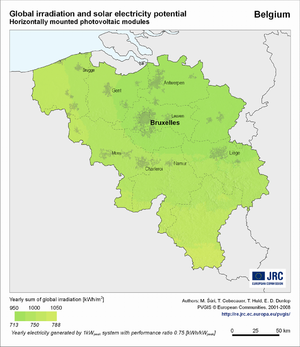 Belgian buildings’ energy performance in general, and energy intensity in the region of Flanders, have been identified as key areas of challenge in implementing energy efficiency measures; both are considerably worse than the EU average. Flanders also has numerous indigenous targets for energy efficiency, including a 20% reduction in regional energy intensity by 2020, and an annual 3.5% primary energy saving obligation on distribution system operators, which is legally binding as of 2011. Transport has also been identified as a key area for development, given recent declines in transport sector efficiency leading to the 2010 efficiency index being only 3% lower than in 2000. To this end, public transport is being promoted, through free access to certain categories of citizens (for example, those over 65 years of age), and through the promotion of mobility planning tools. The Belgian federation of grid operators outlined in this regard that parts of the Belgian grid, especially in the coastal regions and in the far east of Wallonia, are overloaded, mainly due to the raising share of RES technologies and their connection to the grid. As a consequence, there are local shortages in available capacities. Reinforcements are foreseen; yet, they will take several years. For the meantime, stakeholders elaborated on the option of providing flexible access to the grid, which would allow grid operators to limit the access of producers, if this would be required. Flemish Energy Agency(Dutch: Vlaams Energieagentschap; VEA) It is a government agency of the Flemish Region under the Flemish Ministry of Environment, Nature and Energy, tasked with the preparation and execution of Flemish energy policy.The Flemish Energy Agency has the following tasks:The promotion and support of the use of renewable energy and green energy;The promotion and support of energy conservation by means of:building standards with regards to energy;emission trading;covenants with the industry;energy demand management;reporting in the field of energy economics;The development and execution of social energy policy;Communication to the industry and general public with regard to these aforementioned issues.Among non-governmental organizations (NGOs), Wallonia Biomass Energy Agency (ERBE), the Flemish Institute for Technological Research (VITO), Belgian Biomass Association (BELBIOM) and the Agricultural Engineering Station of the Centre for Agronomic Research (CRA Gembloux) are all involved in statistics generation, experimentation and community work or assistance to municipalities and enterprises in the implementation of bioenergy work and projects. ElectricityThe three biggest producers together generated around 95% of the total power produced. In the case of large-scale customers connected to the federal grid (voltage higher than 70 kV), Electrabel's share was 90.2% in 2011. At the wholesale trade level, the market share of the three biggest firms (ECS, Electrabel, SPE) was 85.9% in 2011. At generation and wholesale level, markets are highly concentrated. Integration with neighbouring markets was successfully carried out through the Trilateral Market Coupling, involving Belgium, the Netherlands and FranceGasThough gas is imported mainly through long-term contracts, Belgium has a physical wholesale gas trading platform at Zeebrugge. In the past, development of the hub has suffered from the lack of an entry-exit tariff system and from large amounts of transmission capacity being locked in transit contracts. This situation is likely to improve considerably with the introduction of a new market and transmission model on 1 October 2012. The gas market in Belgium is characterised by a high degree of concentration. At wholesale level, the three largest suppliers (Distrigaz, ECS, SPE) covered 86% of the market by available gas. The CREG’s independence is assured through its statutes and is a European directive requirement. The Belgium National Committee is a member of the World Energy Council and as such aims to promote sustainable energy development in Belgium, as a part of the WEC’s energy vision. As a member of the WEC network, the organisation is committed to representing the Belgian perspective within national, regional and global energy debates. National Renewable Energy Action Plan (NREAP)The National Renewable Energy Action Plan (NREAP) for Belgium was submitted in December 2010. The target according to Annex I of Directive 2009/28/EC is 13% for the year 2020 and the projected NREAP share in that year exactly matches the target.According to the projection, the most important contribution in the year 2020 is expected from biomass – for renewable heating and cooling (2034 ktoe, 38% of all renewable energy). Second important contribution is expected from biomass for renewable electricity (11.0 TWh or 949 ktoe, 18% of all renewable energy). The third largest contribution is from wind power (10.5 TWh or 901 ktoe, 17% of all renewable energy). Wind power contributes with 4.3 GW (10.5 TWh). For solar photovoltaic the 2020 contribution is projected to be 1.3 GW (1.1 TWh). For solar thermal the 2020 contribution is projected to be 199 ktoe.The two most important biofuels are projected to contribute 698 ktoe (biodiesel) and 91 ktoe (bioethanol / bio-ETBE) by 2020. The renewable electricity production from solid biomass amounts to 9.6 TWh (823 ktoe) and for biogas it is expected to be 1.4 TWh (124 ktoe). The consumption of renewable heat is expected to amount to 1947 ktoe for solid biomass and 55 ktoe for biogas.In Belgium, electricity from renewable sources is promoted mainly through a quota system based on the trade of certificates. In general, renewable energy is a regional matter; only offshore wind and hydro power are governed by national regulations. The federal grid operator shall meet public obligations, which include the purchase of green certificates at a minimum price set by law for certain renewable electricity generation technologies. Every region (Wallonia, Flanders, Brussels Capital) has its own standards of support for renewable energy, based on a national framework. Electricity suppliers are obliged to present green certificates to prove that a certain proportion (quota) of the electricity supplied to their final consumers in Belgium was generated from renewable sources. This quota may differ according to the region. The tradable certificates schemes established by the Federal Authority and the Belgian regions can be summarised as follows. In the case of offshore wind energy, there is an obligation of the transmission system operator (Elia) to buy the certificates at a minimum price set by federal legislation and an obligation of sell these certificates on the regional markets. In the case of the Flemish Region and the Walloon Region, the combination of compulsory quotas imposed on suppliers and on minimum feed-in price guarantees imposed on the DSO (Flemish Region) or on the LTSO (Walloon Region) is in place. In the case of the Brussels Capital Region, the obligation is imposed on electricity suppliers to observe a certain quota of green certificates. The system of tradable green certificates knows a number of mechanisms to ensure regular feedback. In the Flemish Region a study is carried out every 3 years to estimate the need for exploitation support to ensure the acceptable profitability of projects. In the Walloon Region: Every 3 years CWaPE must carry out a detailed analysis of the technical and economic characteristics of the different electricity production chains. CWaPE also conducts an annual assessment of the functioning of the market in green certificates and compiles projections on the development of new medium-term installations (5 years). 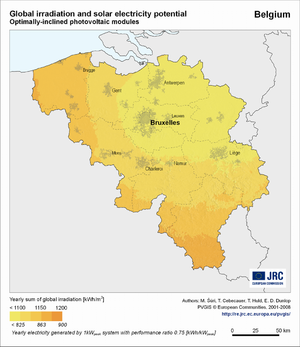 Except for coal and some renewable energy potential, Belgium has no natural energy sources. The coal mines that supported the country’s industrial revolution in the 19th century have become unprofitable and the last mine was closed in 1994. The country now imports all its coal, natural gas and petroleum requirements for its energy needs that amount to almost 42,000 ktoe (kilo-ton oil equivalent, or about 489 TWh). Belgium does not produce gas. In 2010, annual gas imports amounted to 20 bcm, with pipeline imports accounting for 16.2 bcm and LNG imports for 3.3 bcm. In 2010, the main suppliers were Norway (37%), the Netherlands (30%) and Qatar (14%). According to the special act of institutional reform of 8 August 1980 (reviewed by the act of 8 August 1988 and the special act of 16 July 1993) the Federal State and the Regions - Flanders, Wallonia and Brussels - Capital- share competences on energy issues. In fact, the regional authorities have major responsibilities for designing and implementing energy policies, while the Federal Government is responsible for nuclear power, off-shore wind parks, production infrastructure and tariffs (e.g. for using the transmission and distribution networks). Transmission of electricity at a voltage level above 70 kV is a federal responsibility, while distribution and local transmission of electricity over networks with a voltage less than or equal to 70 kV is a regional responsibility. In addition, the 1993 special act empowered the Regions with residual competences, which means that all issues that are not formally attributed to the federal authorities fall under the competence of the Regions in case of conflict.National Climate CommitteeIn order to coordinate between Federal and Regional government, a National Climate Committee has been set up, formed of 16 members (4 for each entity), with the aim to evaluate the performance and to supervise on the Climate methodology and adaptation. 1992: Tax deduction for investments in energy efficiency & renewable energy by Enterprises - Income Tax Code of 1992, Article 69, § 1, 2, b and c. This deduction for increased investments applies to fixed assets which tend to promote research and development of new products and advanced technologies which have no harmful effect on the environment and tend to a more rational use of energy.Loi du 29 Avril 1999: Adoption of the energy legislation for the electricity and gas markets. The Act establishes a general framework for the energy market and also applies to renewable energy. This law constitutes a part of the legal basis for special regulations for the promotion of renewable energy with regard to the implementation of certificate trading, grid connection of and priority access for renewables.1 January 2003: Tax deductions for investments in energy efficiency and renewable energy: The Federal Public Service (FPS) of Belgium offers tax reductions for individuals undertaking energy efficiency and certain renewable energy investments in their homes.2005: Third Party financing for energy efficiency investments – The Belgian Government established the Belgian Energy Service Company (ESCO) to promote energy efficiency, mainly in public buildings. The Belgian ESCO started with 1.5 million euro of government capital from the Kyoto Fund and is supposed to have 5 million Euro of private funding.October 2008: All the levels of Belgian administration have been promoting new measures to deal with the climate change and energy challenge that ranged from the approval in April 2009 of the second National Allocation Plan (2009-2012) to promote renewable energy and energy efficiency measures.Law of 22 July 2009 (Royal Decree of 10 August 2009). As of July 2009, all registered fossil fuel companies in Belgium must incorporate 4% of biofuels in “normal” fuel which is made available on the Belgian market. Penalties are applied where the quantity of incorporated biofuels does not meet the requirement. Generally, grid connection in Belgium is characterised by a strict division of competencies between the federal level and the regions. No specific obligation is set out as to obligate grid operators to connect RES-E installations; with an exception regarding the “Inform & Fit” procedure for small installations with a capacity of up to 10 kW. Furthermore, there is also no obligation for grid operators to reinforce or expand their grids to allow for a specific connection, which may be denied with reference to insufficient grid connection capacities. Nor is the grid operator obliged to pay compensation under such circumstances. A flexible connection regime is under discussion, but yet not finally approved. As far as the costs of grid connection are concerned, Belgium is operating on a shallow costs model. Grid connection costs of offshore installations are in addition subsidised by the Belgian government, via the TSO.The Belgian federal and regional laws provide for general obligations of grid operators, regarding the development of the grids to offer sufficient grid capacities and to meet existing demand. Still, obligations are not RES specific and no explicit obligation is set out as to renewables and specifically required grid reinforcements or expansions to accommodate further growth of these technologies.The main issue to face is the strengthening of the collaboration process between federal governments by paying attention to reduce differences in energy policies, in order to create a single energy market in the region. The Belgian National Regulatory Authority - Commission de Régulation de l’Électricité et du Gaz (CREG), in operation since 2000, employed 72 staff in 2011 with an annual budget of about EUR 15 million. CREG has challenged the new Belgian energy law transposing the Third Package Directives at the Belgian Constitutional Court, arguing that it does not grant CREG sufficient powers or autonomy. There are also three regional regulators (VREG for Flanders, CWAPE for the Walloon region and BRUGEL for the Brussels region). Cooperation between the four regulators is essential to ensure there is a consistent, effective regulatory framework across the country. The regional regulators need to be reinforced to exercise proper regulatory oversight over distribution network charges due to the further regionalisation of distribution of tariffs competences. The main renewable contribution in the Belgian energy mix comes from combustible renewable biomass and waste sources. In both regions there is a fast growing electricity generation coming from wind energy. Brussels-Capital has, because of its limited surface and electricity generation capacity, very limited renewable energy facilities, being mainly solar thermal demonstration projects.SolarConsidering all the existing buildings in Belgium, the potential roof surface that can be used to install solar panel equals around 250 km².Wind EnergyOver the last decade, onshore wind capacity has been highly developed in Belgium. In 2010, the Belgian onshore wind production capacity equalled 730 MW. The typical Belgian utilisation rate of wind generators is around 2,135 hours full capacity equivalent. Partially due to the rapid development of this energy source, anti‐wind lobbies are against a further development of new capacities arguing that wind turbines have a negative impact on landscape quality. In response to these criticisms, regional authorities have tried to determine where new windmills could be built. At present, windmills can only be installed in some restricted areas.Studies about renewable energy potential have been conducted both in the Flemish and Walloon regions in order to assess the maximum onshore wind capacities. In so far as Brussels is an almost exclusively urban region, no significant wind potential can be installed there.Different studies have tried to estimate the offshore potential of the Belgian maritime area. Mathys et al, 2010 indicates the maximum energy potential given that the Belgian continental shelf is covered by wind turbines except in some specific zones reserved for maritime navigation, military exercises and some visual limitations. The theoretical potential is estimated in range of 12.6‐16.8 GW. Biomass & BiofuelsIn 2009, biomass and biogas were used to generate 3.5 TWh or 3.8% of gross domestic electricity production. In 2010 5.07 million tonnes of waste was produced in Belgium. Of which 1.75 Mt was incinerated. Nearly all (99.8% of the time) energy was recovered during incineration. Non-renewable waste was used for producing 1.4% of the gross domestic electricity production. 1.9 Mt was recycled and 1 Mt was composted or fermented, only 0.062 Mt was dumped. Ten years earlier this percentage was only 0.71%.HydroIn 2010, hydroelectric net capacity equals 110 MW in Belgium. The hydroelectric potential is already largely used in Belgium and no important development is foreseen in the future. Therefore, the power capacity of this technology is supposed to equal 120 MW in all scenarios. This page was last modified on 2 June 2011, at 15:49.